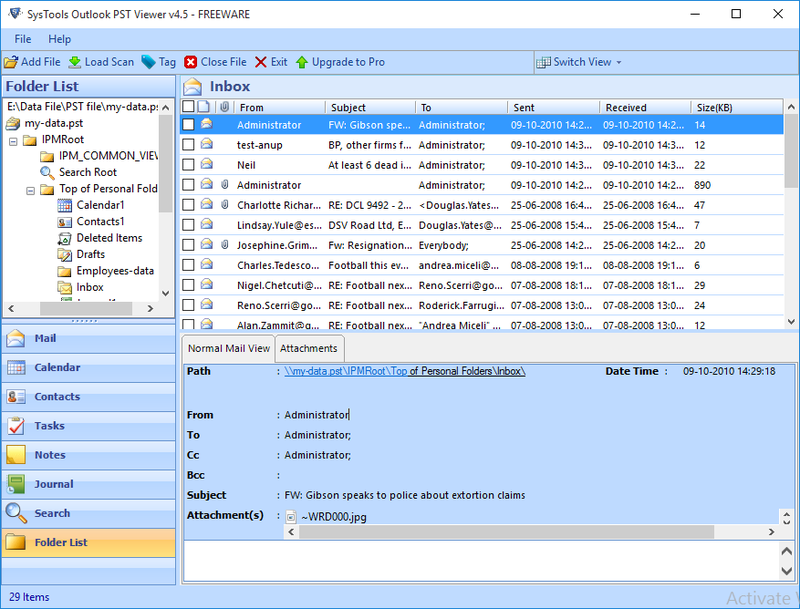 Outlook PST file viewer tool allows the users to open and view MS Outlook items like emails, contacts, calendars, notes, tasks and journals. There is a Normal Mail View and Attachment view section to view embedded attachments. There are two scanning mode in this software, Quick scan which is default scanning option to open healthy pst file and to open and read corrupt pst file there is a advanced scan option. 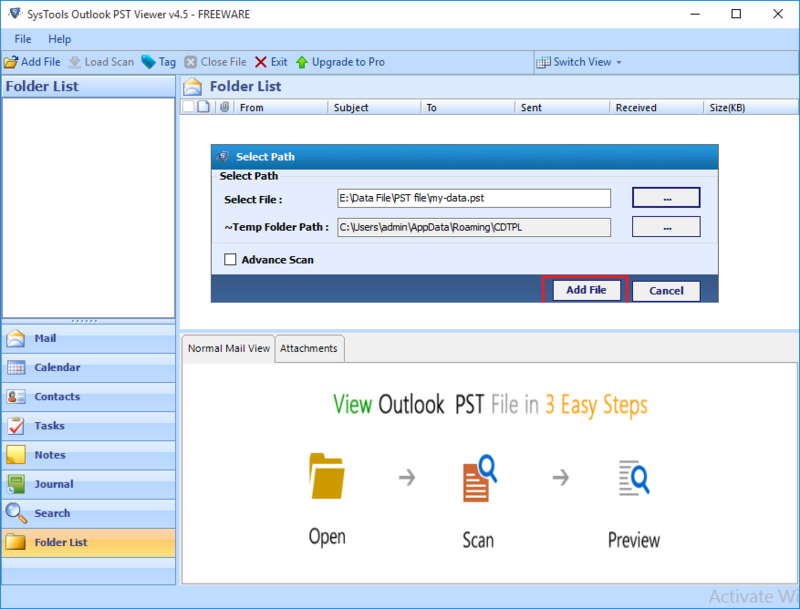 PST reader has the ability to view pst contents without Outlook Installation and configuration. It is useful when you have orphan PST file and need to open, view and read PST data. After the software loads and scans all items of Outlook PST file, it will display each and every items with all its properties. Like for mails, it will view its attributes like Cc, Bcc, to, from, subject, size etc and for contacts name, address, phone number etc. All Contacts of MS Outlook can be opened and view in PST opener software in the same way as it seems in Outlook. It supports to open the contacts without Outlook. Open PST tool also facilitates to view the Calendars saved in MS Outlook PST file. Users can open the calendars from calendar folder. PST is called Personal Storage Table. Microsoft Outlook stores its emails, contacts, calendars, notes , journals, tasks in a database file called .pst file. In this way users save Outlook data file in their personal computer location. PST file created by Outlook 97, 98, 2000, 2002 has a size limit of 2GB. And Outlook 2003 and its later versions creates the UNICODE PST file and has a size limit of 20-50GB. If the file size exceeded beyond its limit it becomes vulnerable for corruption. As PST is created by MS Outlook, it is supported only in Outlook. 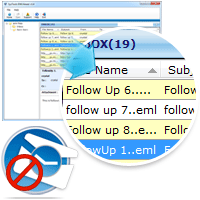 If users want to view PST contents without outlook installed in the system it creates trouble for them. 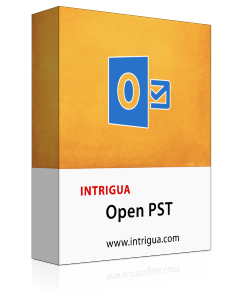 Intrigua introduces the freeware Open PST utility which makes the users to view and open PST files without Outlook. Step 1: Install and Run the Tool. Step 2: Add PST file. Step 3: Preview of PST Items. Step 4: Switch View Mode. Watch the working of freeware Intrigua PST Opener Software to get preview of all emails. Is it supported by Windows 10 OS? Yes, this PST file Viewer tool supports to all versions of Window 10, 8,7,5 etc. You can use this utility in any version of Windows to read pst file. Can I add multiple PST files in a software and open them simultaneously? No, this tool allows to add and open only a single PST file at a time. You can open other PST file by closing the existing file. Does this tool allow to save the emails attachments? 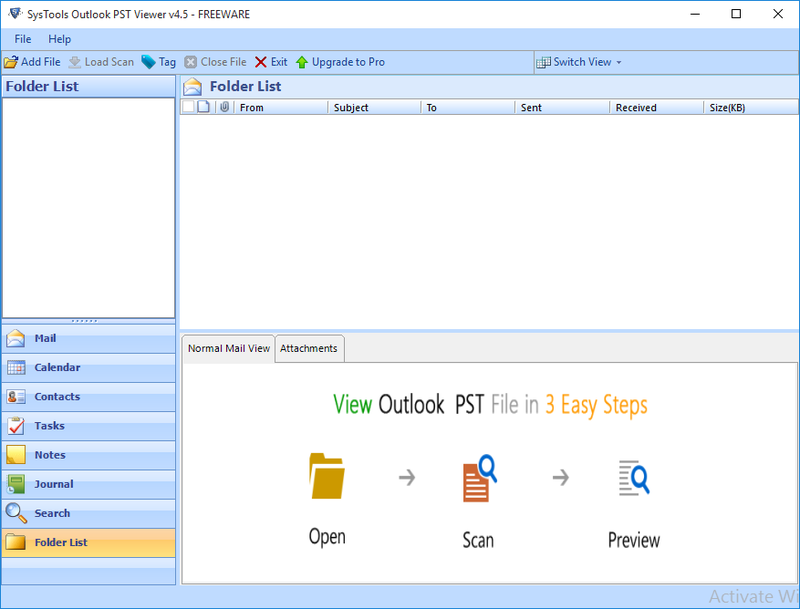 This PST viewer software is designed only to open PST files without Outlook and its attached files. To save the data and attachments upgrade to pro version of software. Do I need to install MS Outlook to run the PST Reader? No, Open PST tool allows to read PST without Outlook free in the system. Can I open my corrupted PST file in this utility? PST opener software allows to open and preview the corrupted PST file and also recover the minor corrupted file. Supports to Windows 10, 8.1, 8 and all below versions. Processor of 1GHz (recommended 2.4 GHz). Minimum 50 MB of Hard Disk space. 512 MB of RAM( 1Gb recommended). 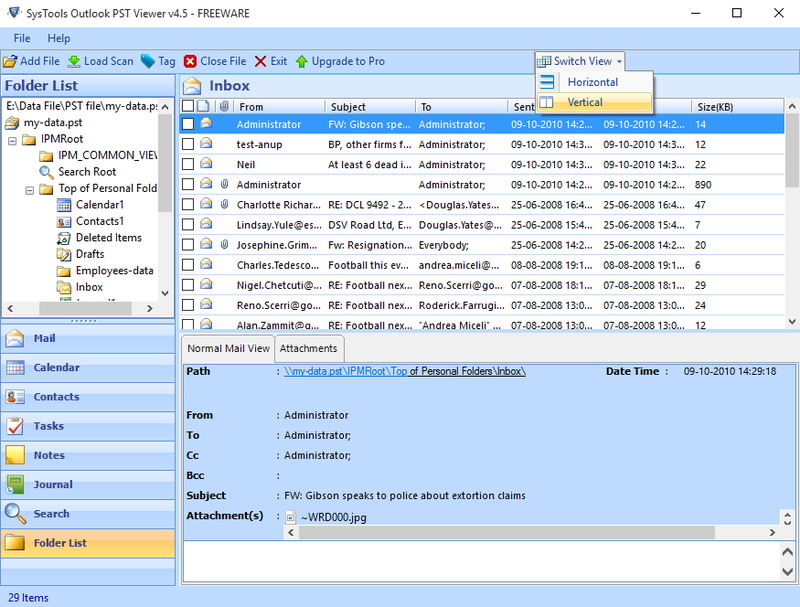 PST Reader is efficient software, this is very portable and useful tool to open the Outlook created file and read pst without Outlook free and has a very simple User interface. It is very easy to use this tool even for a non-technical person. There are numerous free software to open and view your PST file but Intrigua PST file viewer tool is best as it also read the corrupted PST file and recover it as well. I am very thankful to developver of PST opener software.